Beast+ continues from where Beast left off, though it is marketed as a stand-alone series. Episodes are reduced to approximately ten minutes in length, airing in the thirty minute time-slot Oha Coliseum alongside the Saru Getchu anime. Beast+ consists of a string of arcs beginning with the appearance of the Professor and Zero (both from Mega Man Network Transmission). Beast+ continues from where Beast left off. The character designs have changed a bit. 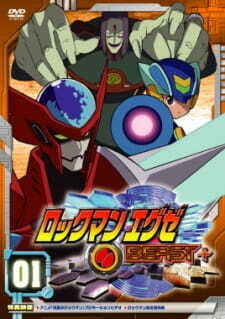 They use characters from games like megaman network transmission and Rockman EXE Phantom of Network. It stars off with Megaman having to fight a virus named Zero for the first half of the series then for the finale Cache comes in as the final boss from Rockman EXE Phantom of Network. Even though its shortened to 10 minutes its still enjoyable for megaman fans.